The Conid company is not as widely known as others. If this is your first exposure to it, take a look at their website and read through their information. There are also numberous posts about their pens. I came across it a year ago and become very interested in their design/manufacturing capabilities and the advances they were making with fountain pen manufacturing. In a market that has had very few real advances over the years, it is really refreshing to see how they are using very tight tolerance manufacturing to bring their ideas to life. 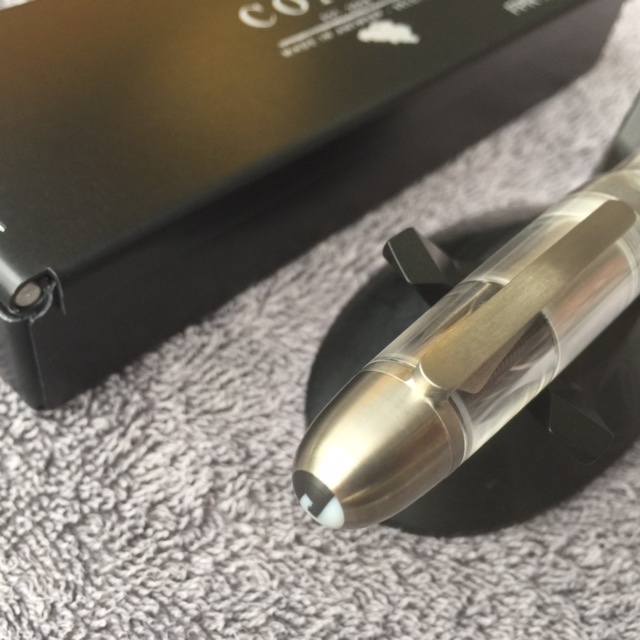 A lot of us have been waiting for the Conid CAISO Kingsize Bulkfiler fountain pens since they were introduced as a concept model in 2015. I sold about $1,400 worth of fountains pens to get ready. Part of that was in hopes that the new Conid would be the ultimate daily user, and that I wouldn't need too many other pens. Also, I needed funds to make the purchase. I jumped on board when the order form was available on the Conid website and was hopeful that I would see the pen in a few months. It took little longer to get the pen fully ready for prime time. The last item to get right was the feed. The designers originally made a clear feed, but they were not able to get the performance and reliability for the unique ink shut off capability of the pen, so they manufactured the feeds from hard rubber. The pen has a huge capacity, and an automatic ink shut-off when capped, useful for those flying regularly. 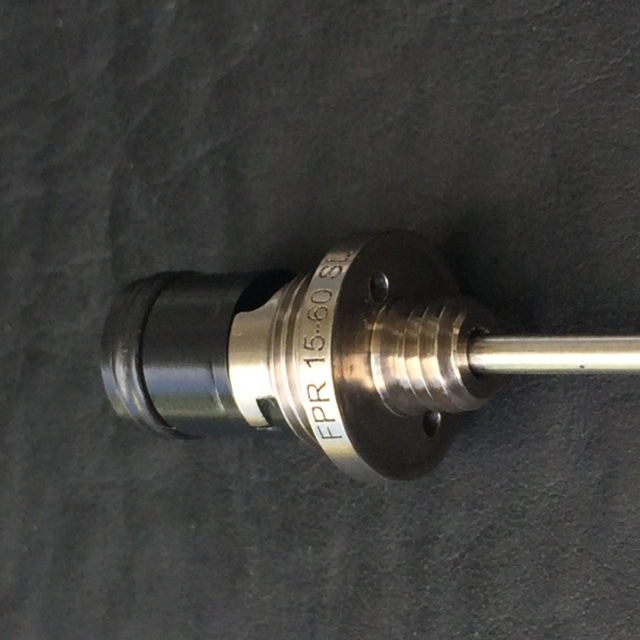 I received my pen this week, one of 60 from the First Production Run (FPR). There was also a flat top version with 60 units available. The pen is outstanding! If you need any more detail, please read on. 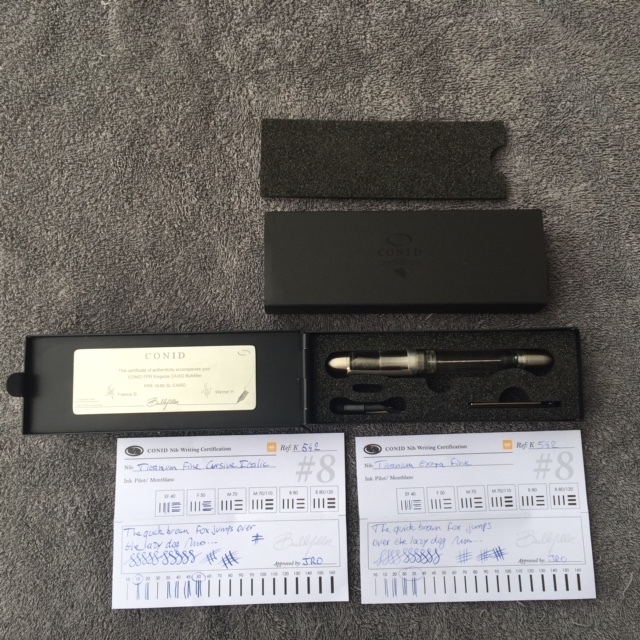 The photos of the pen online were a great teaser as we waited for the pens to be completed and sent to the customers. It was exciting to receive the package and open it up, to finally see the pen in person, and be able to try all of the features. My initial impression was mixed. The CAISO demonstrator is a pen that will meet my needs, for a lifetime. It is not a gorgeous pen like some of those that I sold. More on that as I go through the features. The CAISO is made almost entirely of titanium and clear acrylic. It has an engraving near the blind cap that is essentially a serial number. This pen has "FPR 15-60 SL". 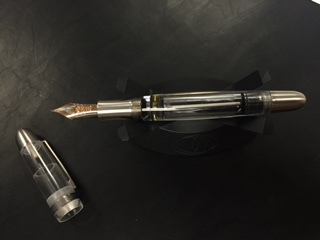 It is the First Production Run of this model, and is #15 of 60 total pens, in the streamline (SL) version. They also made 60 units of a flat-top. The band on the cap has "Conid Bulkfiller Fountainbel". 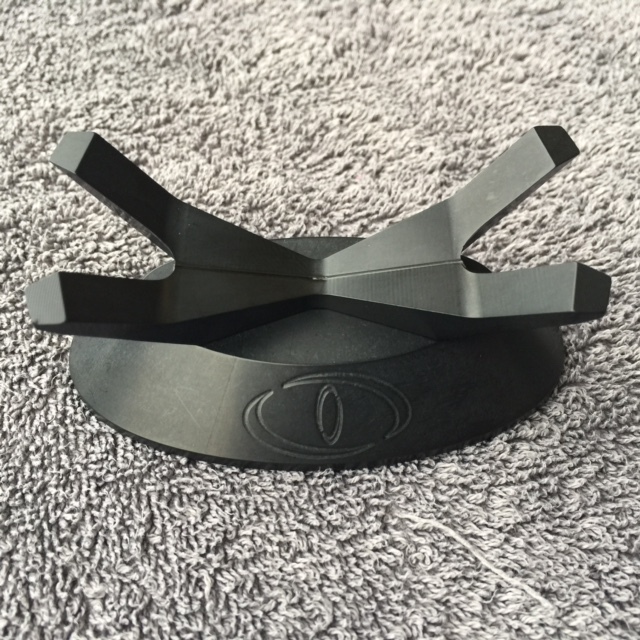 The clip is made of a single piece of titanium that is machined to shape. Conid has posted a video of numerous manufacturing steps on their website, part of which shows the clip being made. 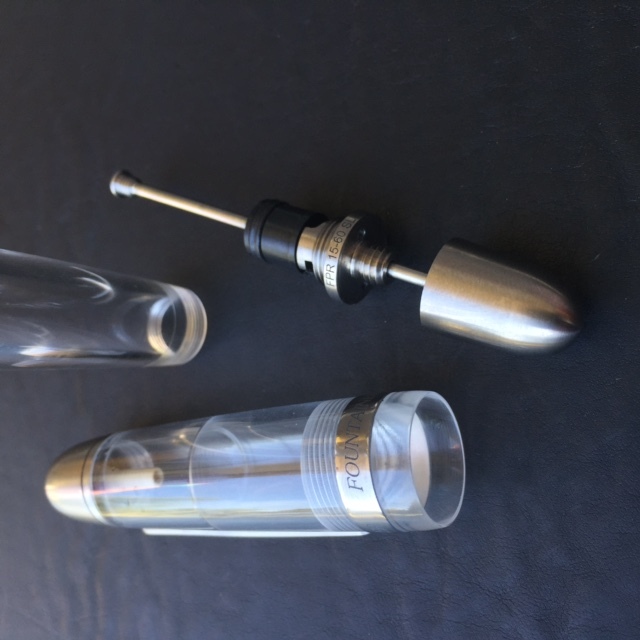 The top of the cap is titanium with a black/white acrylic inset representing the piston mechanism. The pen feels very smooth and exudes quality. I didn't detect any manufacturing flaws. The only thing I noticed that is not uniform is that the portion of the barrel behind the section and threads is slightly yellow. It may be adhesive. I remember reading some where that the entire pen is screwed together except for one part. The pen should wear well, looking essentially the same after years of use. The clip is very tight. Once clipped, it is unlikely to be inadvertently dislodged. The pen is fairly weighty, but feels very nice in use. It is approximately the size of a Montlanc 149. The cap does post, but it takes a little extra effort to make it tight. The pen writes well either way. I may post it when writing for extending periods of time, but use it unposted for quick notes. Unposted, the pen is long enough to extend well beyond the web of my hand. The pen can be ordered with #8 Bock made nibs of various materials: steel, titanium or gold. I ordered the pen with a Fine titanium nib, modified to an Extra Fine. Later I decided to add a Fine titanium modified to a smooth cursive italic. 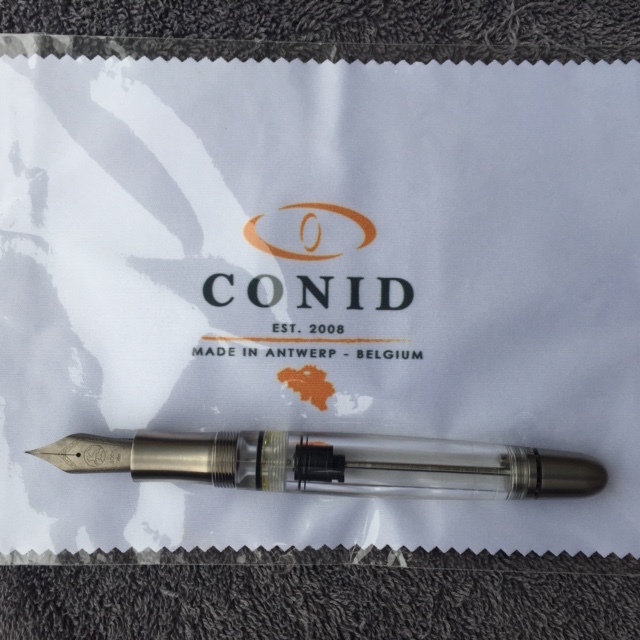 When the pen was ready to be sent a couple weeks ago, Conid sent a photo of the pen with samples of the writing with each nib. That was cool! The extra fine nib was about perfect for me, great for notes and general writing. It had slight feedback, but it wasn't too bad. After some use though, it has gotten very smooth and consistent. Under a loupe, I discovered a very well tuned nib. 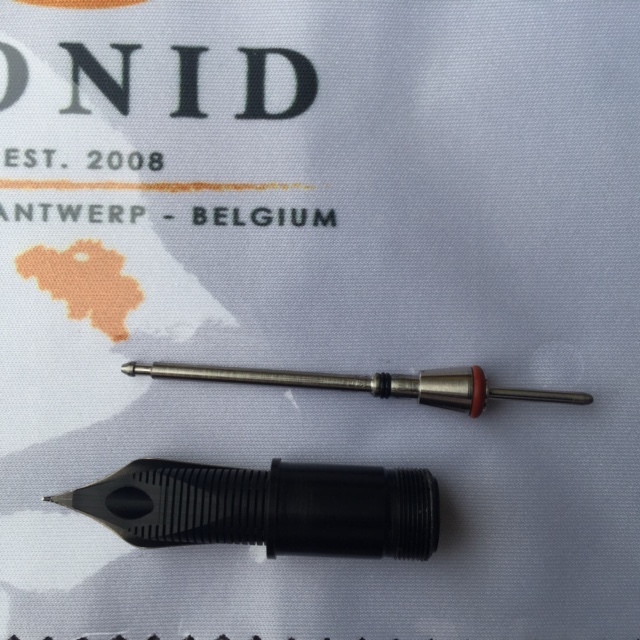 Some nib meisters remove most of the tipping material to make narrow nibs, but this wasn't the case on the Conid. The flow is nice, about a 7 out of 10. I received a second section with the cursive italic nib installed. That nib also has a large amount of tipping remaining. 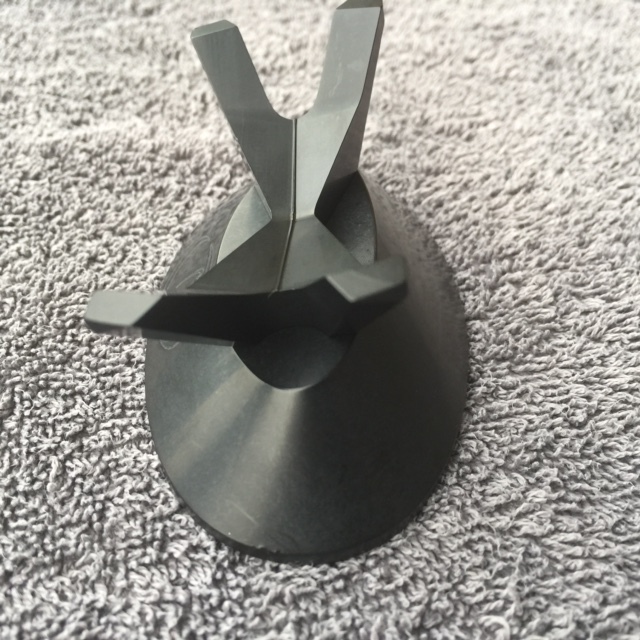 It has a gap between the tines to allow for more flow. It writes very smooth and has nice variation for the narrow width that I wanted. 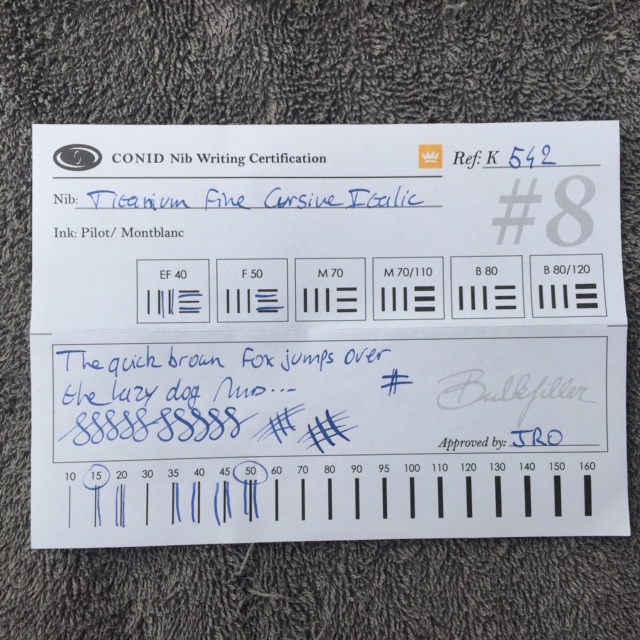 Both nibs were very well tuned. The additional cost was 25 pounds, I believe, and based on competitors pricing, I wasn't expecting top notch performance. This is one of the best kept secrets in the fountain pen world. Fountainbel is a long time fountain pen user and repair expert, and his nib work is outstanding! It is easy to change out the nibs, but the titanium rod through the middle needs to be transferred when swapping nibs. My only issues with the nib choices is not to be able to get one that is branded by Conid in this size. The smaller models have a #6 nib with a unique Conid graphic. The nibs that come with the CAISO do not take away from that pen, but a Conid unique nib would make the pen even more classy. The CAISO mechanism is a combination of a stem in the top of the cap, and a rod through the feed that seals the ink chamber when capped. 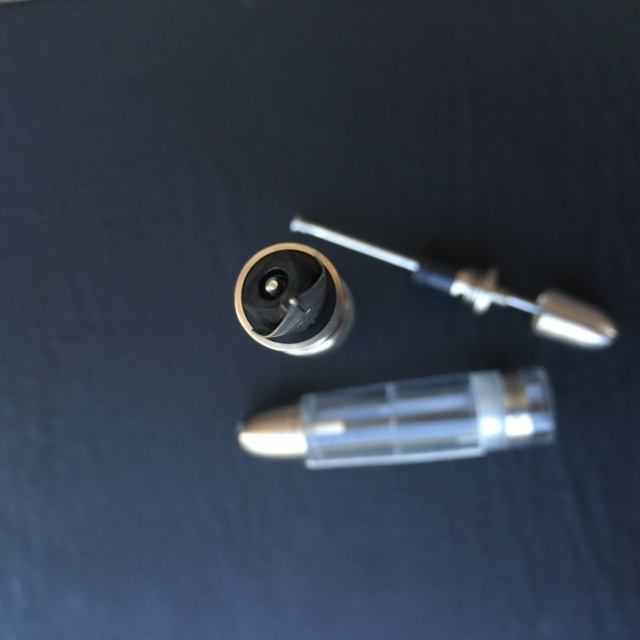 When the cap is removed, the rod is pulled out slightly, opening the ink chamber for use. It is seamless, requires no additional thought or effort, but does add slightly to the effort needed to cap and up cap the pen. The piston stays near the blind cap most of its life, but the value of their filling system is that the piston moves nearly the full length of the barrel through the use of a piston rod that screws into the piston to move it, but then disengages after it is filled. The pen doesn't need very much room at the end of the barrel for the piston, unlike telescoping pistons. A huge advantage of this mechanism for me is that flushing is very simple and effective. Rather than turning a knob to move the piston, this is a simple push/pull. The pen holds over 3 ml of ink when fully filled. That is enough to last me for months probably. I like to fill the pen partially and be able to see the ink move around and expose the piston rod. The shape of the barrel behind the section is especially nice, similar to an hourglass. For maintenance, the piston can be removed with Conid-provided tools for cleaning and lubricating. The nib section can easily be unscrewed for ultrasonic cleaning and to flush out the barrel. The cost of this pen is assumed to be based on the complexity of the filling system, the maching of the titanium parts, the close tolerances, the new ink shut off system, etc. Most other high end pens are either very decorative, using gold, sterling, etc. or made with somewhat delicate materials, like urushi. The reasons I sold other pens (Danitrio, Nakaya, Namiki) to buy this one were exclusivity, durability, size, and performance. If I bought the pen without selling others to fund it, the price would have been painful. I have no regrets buying this pen, and plan to keep it for one of my children to use one day. Was it worth it? This style won't appeal to everyone; some want gold trim, some want urushi, some lightweight, etc. It is a completely functional pen that is unique. It is not pretentious; I have no problem using it in meetings or amoung strangers. Previous pens have seemed to flashy or expensive looking to use in public. For my use, this pen is as good as it gets! The score may seem low for a pen that I like so much. The proof is that I sold others pens to buy this one and do not regret it! No pen is perfect, as is evidenced by the buying and selling of fountain pens worldwide. Is there anyone out there who has bought a pen and never looked for another with other features? Not many of us on this form have been able to do that! I really am glad that I got in on this pen model release from Conid. It is similar to their regular Kingsize, but adds the CAISO system and more titanium. 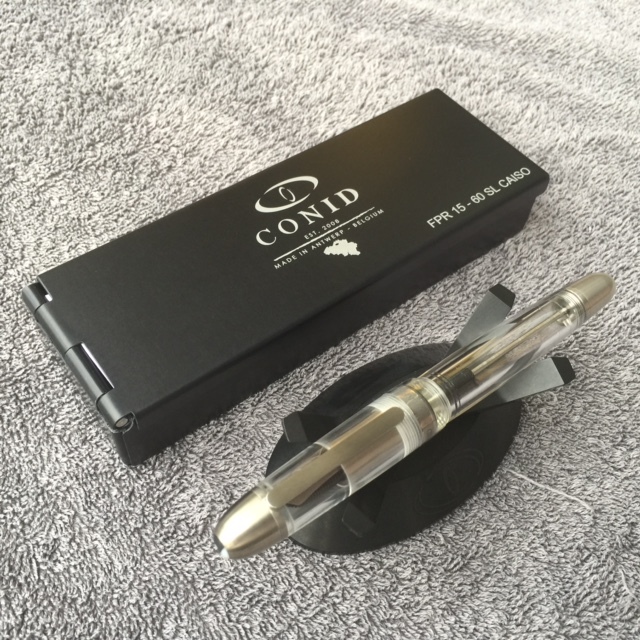 Conid ships their pens in a custom anodized aluminum case that holds the pen, tools, and extra nibs. The inside of the lid has a titanium name plate with the model nomenclature. Very cool! Conid added a pen stand for this model that was previously not available on their website. The pen stand is fully functional and looks good. It feels somewhat soft, and I don't worry about putting the pen on it and getting wear marks. The stand adds value to the pen. 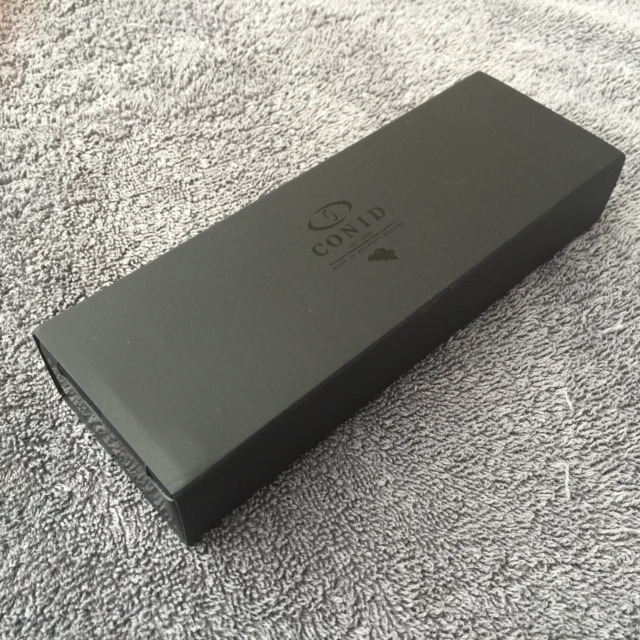 Well done Conid! This pen was a home run! Edited by brad7k, 15 August 2016 - 01:53. Cool review and very nice pen. Excellent review and fantastic pen. Great review. I'm probably going to start with a Conid Minimalistica but may end up with the CAISO. Also, the links to pictures were broken. Did anyone else have that problem? That is what got me hooked. I'm really sure you will like the Minimalistica and then be on your way for the CASIO like I did. Be sure to get the wrench to take it apart for a super thorough cleaning, you really appreciate the engineering and art that goes in to these when you do that. Yes. Get a 404 Page Not Found. Edited by Tasmith, 14 August 2016 - 20:10. Sorry about the photos. I have them on Flickr but can't get the links to work. Soon hopefully! I can now see them on your review. Nice pen! Does the metal section feel a bit slippery compared to non-metal sections? And how to you find the weight/balance of the Caiso one? Edited by sannidh, 15 August 2016 - 04:42. Brad - I am glad to see this review and that you indeed ordered the pen. Thank you for sharing your thoughts and I am glad it was worth the expense and loss of other pens. The streamline looks really good with the Ti components. Your old Mikado is doing well. I'll have to take it back out agian after reding this review. The metal section isn't a problem in use. It is concave the way many older fountain pens were, and works very well to keep my fingers in place. It feels good when writing. The pen is a little heavier than others I have been using lately, but feels like a luxury car with a very smooth ride. Zaddick, funny thing about the Mikado; I almost kept that one to put the nib into the CAISO, because I think that is the best looking #8 sized nib I have seen! Welcome to the world of Conid. You'll find your other pens ignored, unintentionally, as the quality, dependability and practicality of the system and manufacturing draws other manufacturers' shortcomings into sharp relief. Congratulations, and enjoy your incredible new pen in good health. Lovely Review, I think this one is on my short list, was leaning towards the smaller one before reading this. Thanks for the review. It is nice to see after that monster thread watching the production. It seems that the Conids are really as much about the experience and process as the pen itself. Kind of like and industrial version of the Nakaya experience. The piston mechanism is a thing of beauty!! After using about 1/4 of a barrel of ink, I cleaned the pen thoroughly and had some fun taking it apart for a closer look. The piston is precisely made and very functional. Rinsing a pen always takes a few cycles, which was a LOT quicker on the Conid than a typical piston filler. For me, that means I will probably flush this better in-between inks. With the direct push/pull action, the water is forced through the feed quickly. The middle photo above shows the end of the nib and the ink shut-off piston within the feed. One thing to note, after filling, make sure that little shut-off rod is clean, or it will transfer ink to the end of the shaft in the cap. Not a big deal, just something to be aware of. The stand from the side. Note that it is angled forward, which is a subtle but nice touch. and from the front. It has the Conid symbol on the base. The mechanism for the ink-shut off has a secondary feature - it makes the cap secure, no way that it will unscrew accidentally. Edited by brad7k, 17 August 2016 - 00:39. Edited by mongrelnomad, 17 August 2016 - 06:25. Thanks for your thorough CAISO review, much appreciated. Surely glad reading you are happy , enjoy ! As for the BOCK logo on the nib, as far as i know the problem is Bock does not sell "blank"nibs in size 8. Bock is only offering "blank" nibs - without their logo - when ordering a large quantity of nibs in the same size ' (F,M or B ) . 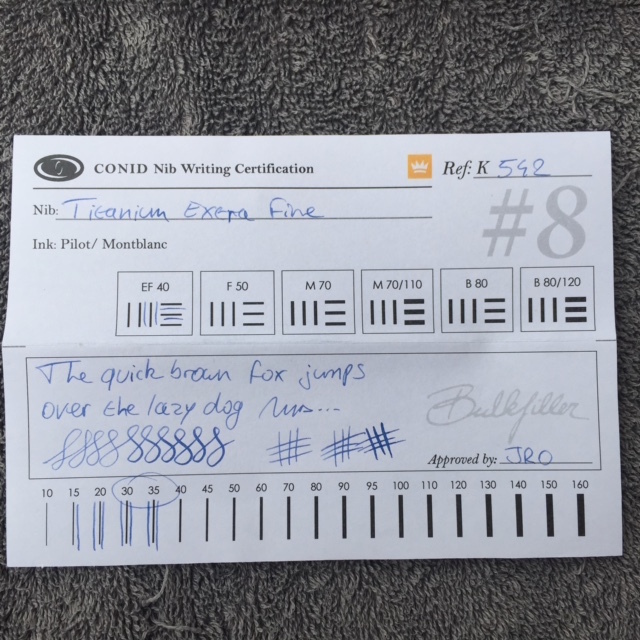 Given the Kingsize Bulkfillers are produced in smaller quantities compared to the regular Bulkfiller versions, Conid can't offer the size 8 nibs with the Conid logo yet. Hope this will change in the future though……. Nice and informative review - thank you. 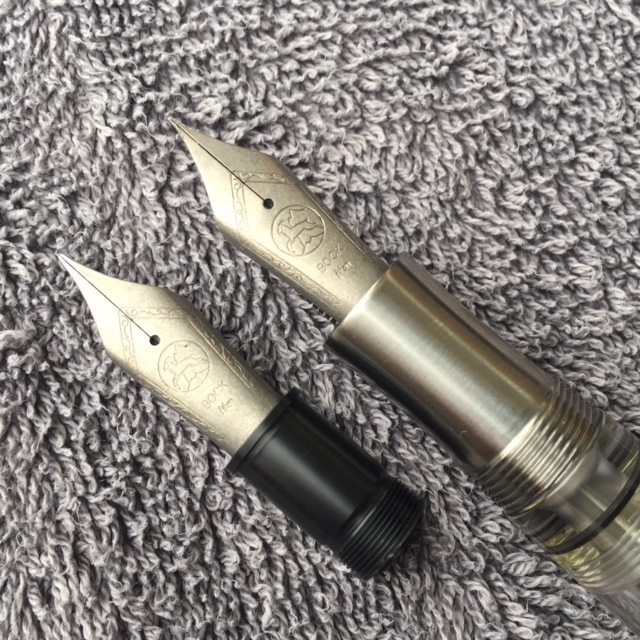 Now a rhetorical question; Pelikan 1000 or a Conid?